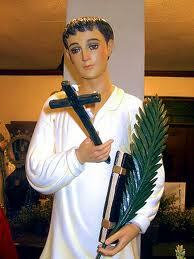 This October 21, the Philippines will have a new saint — Saint Pedro Calungsod, lay catechist and martyr. Until his canonization on Sunday, he will be called Blessed Pedro Calungsod, meaning that he has been "beatified" by the Catholic Church but not yet "canonized." What do beatification and canonization mean? According to the Catholic Encyclopedia, "the Catholic Church canonizes or beatifies only those whose lives have been marked by the exercise of heroic virtue, and only after this has been proved by common repute for sanctity and by conclusive arguments." The official website of Blessed Pedro Calungsod — pedrocalungsod.org — said, "Canonization is the solemn act by which the Pope, with definitive sentence, inscribes in the canon or catalogue of saints a Christian person who has been previously beatified." "By this act, he declares that the person placed on the altar now reigns in eternal glory and decrees that the Universal Church show him honor due to a saint," said an article written by Monsignor Ildebrando Jesus Aliño Leyson. Leyson said, "For the Pope to decide for the canonization, he needs a divine sign of approval which we call a miracle." 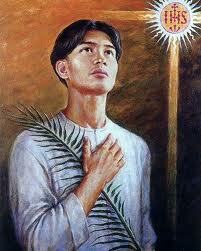 Calungsod was beatified by Pope John Paul II on March 5, 2000.
Who is Blessed Pedro Calungsod? According to the Calungsod website, he was a teenage boy from the Visayas who went with some Spanish Jesuit missionaries from the Philippines to the Ladrones Islands in 1668 to evangelize the Chamorros. "Very little is known about him. We do not even know where exactly in the Visayas he came from or who his parents were," the site said. Some Chamorros were against the evangelization being conducted by the missionaries and began to kill some of them. On April 2, 1672, a day before Passion Sunday of that year, Pedro, then 17 years old, and Padre Diego Luís de San Vitores, the superior of the Mission, went to Guam to evangelize the natives. 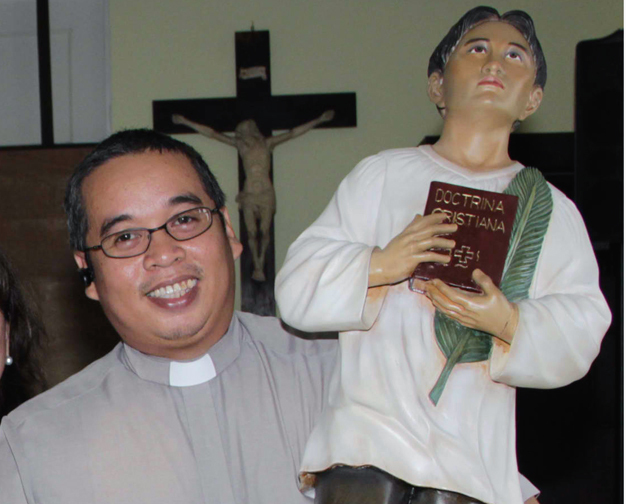 Just after the baptism of an infant, Padre Diego and his companions were attacked, including Calungsod. Calungsod's website said spears were violently hurled at the young Filipino catechist. "The lad skirted the darting spears with remarkable dexterity. Witnesses said that Pedro had all the chances to escape because he was very agile, but he did not want to leave Padre Diego alone," the site said. "Those who personally knew Pedro believed that he would have defeated his fierce aggressors and would have freed both himself and Padre Diego if only he had some weapon because he was a valiant boy but Padre Diego never allowed his companions to carry arms," it added. 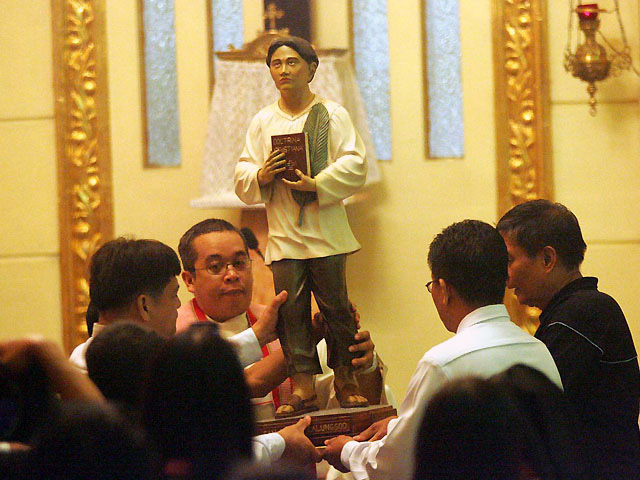 What miracle paved the way for the canonization of Calungsod? Canonization is a process where the Catholic Church declares a deceased person a saint after he or she has been officially beatified or blessed by the Church. To be canonized, there should be an account of a miracle by someone who has asked for guidance from the blessed person. Calungsod became a candidate for canonization because of a miracle that happened through his miraculous intercession in a hospital in Cebu on March 26, 2003. A doctor called upon his help to save a 49-year-old patient that was suffering from coma with a Glasglow scale score of three. A Glasglow scale score of three is the deepest state of coma and renders a person unable to talk, open their eyes and move the body. The doctor who was attending to the patient called upon the intercession of Calungsod since he felt that the patient could die in any moment. During the afternoon of the same day, tests were done on the patient to determine if he was already brain dead. However, the patient regained consciousness a few hours after undergoing through the tests. This miracle was verified and accepted by the Roman Catholic Church after a thorough investigation. Aside from Calungsod, who else will be canonized on October 21? 1. Jacques Berthieu, a French martyr and priest of the Society of Jesus. 2. Giovanni Battista Piamarta, an Italian priest and founder of the Congregation of the Holy Family of Nazareth. 3. Maria del Carmen, Spanish Foundress of the Conceptionist Missionary Sisters of Teaching. 5. Kateri Tekakwitha, an American laywoman.